The dollar printed its lowest point on day 17, which was early to expect a DCL. However, Thursday’s big day caused the dollar to close above the declining trend line to have us label day 17 as the DCL. Consider that there have been 3 previous the daily cycles since printing the intermediate cycle low in January. They have run short at 14 days, 19 days and 14 days respectively. By breaking above the declining trend line the dollar continues that trend of shortened daily cycles. With Thursday being labeled as the DCL, that forms a higher low to signal that this was the first daily cycle of a new intermediate cycle. I want to see a close above the day 9 high for confirmation that this is a new intermediate cycle. The dollar is in a daily uptrend. It will remain in its daily uptrend unless it closes below the lower daily cycle band. Stocks printed a bearish engulfing candle on Wednesday and a swing high on Thursday. Thursday was day 29 for the daily equity cycle, which places stocks 1 day shy of its timing band for a daily cycle low. At this point a close below the the 10 day MA will signal the daily cycle decline. Stocks should then break below the (black) daily uptrend line before forming its DCL. The new high on day 28 locks in a right translated daily cycle formation which aligns with stocks being in a daily uptrend. Stocks will continue in their daily uptrend unless they close below the lower daily cycle band. 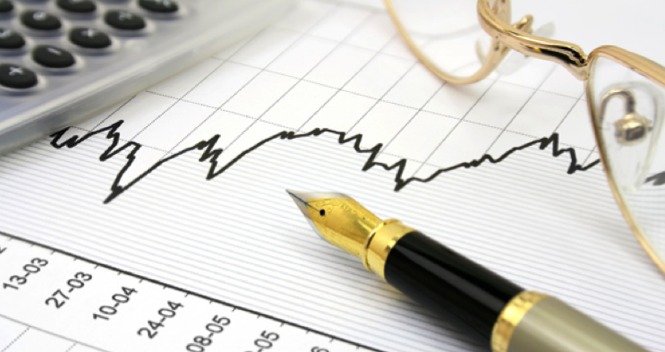 The Weekend Report discusses Dollar, Stocks, Gold, Miners, Oil, & Bonds in terms of daily, weekly and yearly cycles. 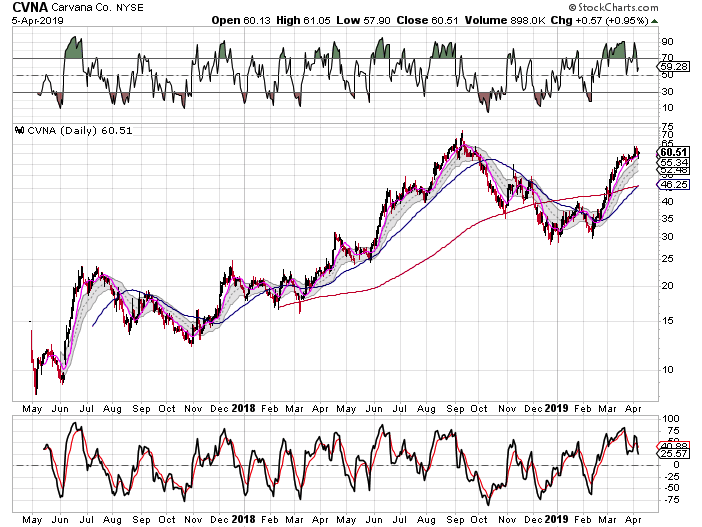 Are Bonds Ready For A Rebound ? 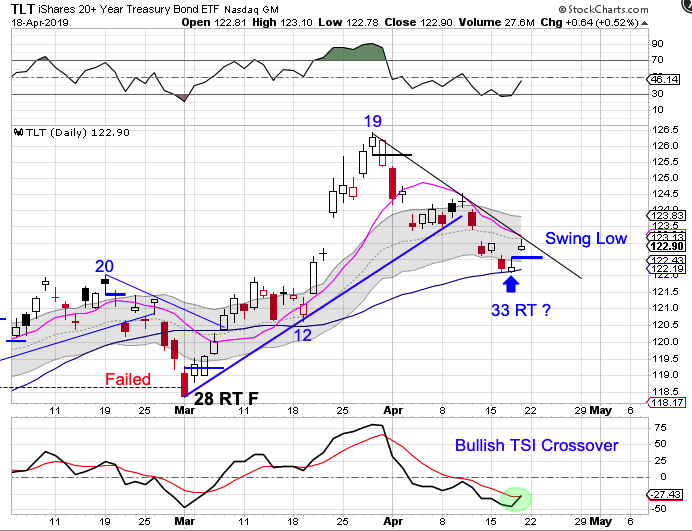 Bonds formed a daily swing low on Thursday. Bonds printed their lowest point on Wednesday, follow the day 19 peak. Wednesday was day 33, which places bonds late in their timing band for a daily cycle low. So Thursday’s swing low has good odds of marking the DCL. A break above the declining trend line will confirm the new daily cycle. 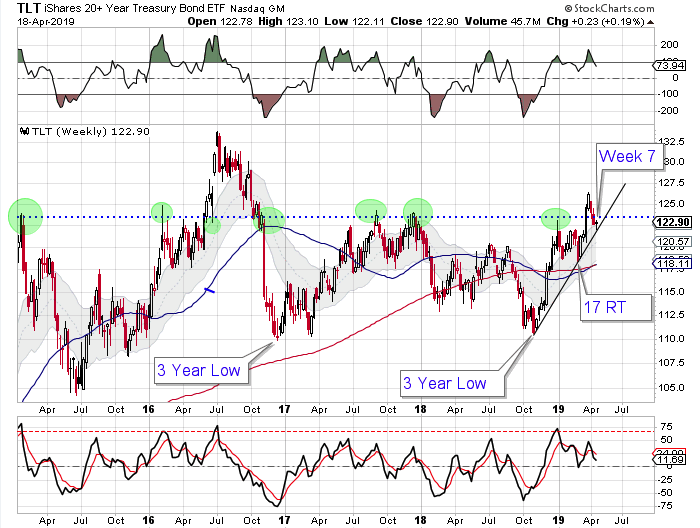 Bonds broke above long term resistance in late March. The decline into the pending DCL has caused bonds to back test the resistance level. Bonds are currently forming a bullish weekly reversal off of the weekly trend line. 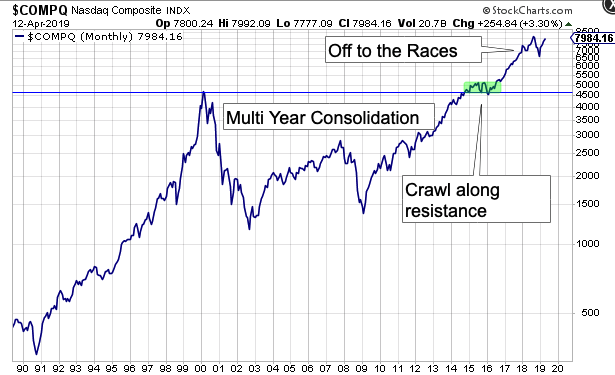 A close back above the long term resistance level should result in a trending move. 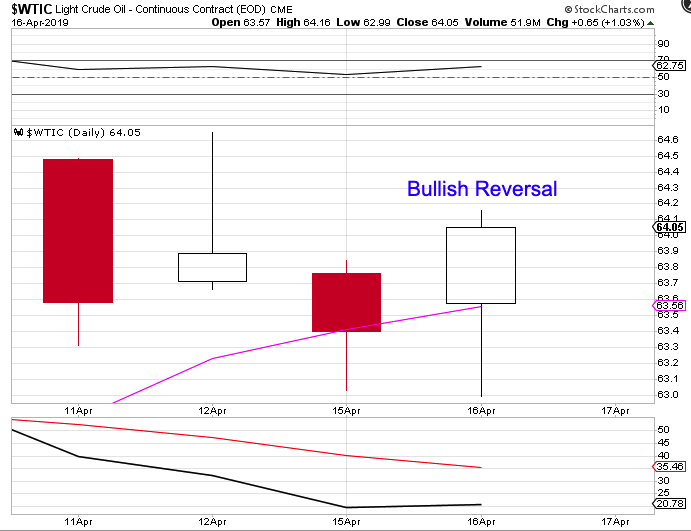 Oil formed a bullish reversal on Tuesday to negate Monday’s weekly swing high. 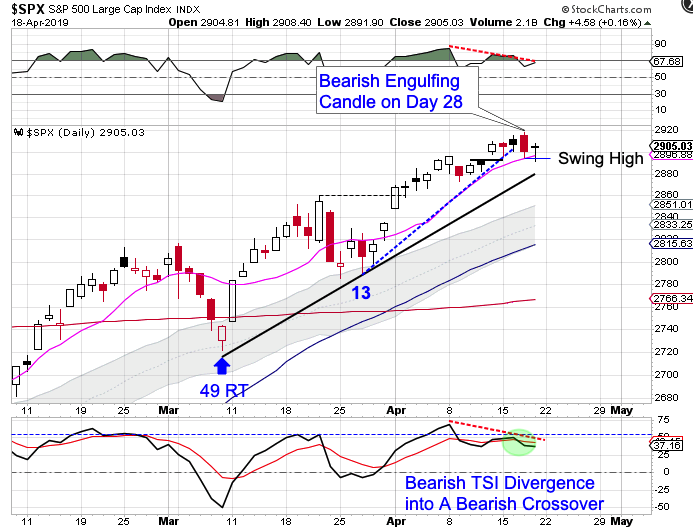 Tuesday’s bullish reversal formed on the support of the 10 day MA. Since emerging from its multi year cycle low in late December oil has not delivered anything that looks like an easily identifiable daily cycle low. Oil has embarked on a powerful daily uptrend that has obscured our daily cycle counts. This daily uptrend has been characterized by peaks above the upper daily cycle band and lows above the lower daly cycle band. The correct strategy in a daily uptrend is buy the swing low. A break above 64.16 will form a daily swing low. That will keep oil in its daily uptrend and deliver a cycle band buy signal. 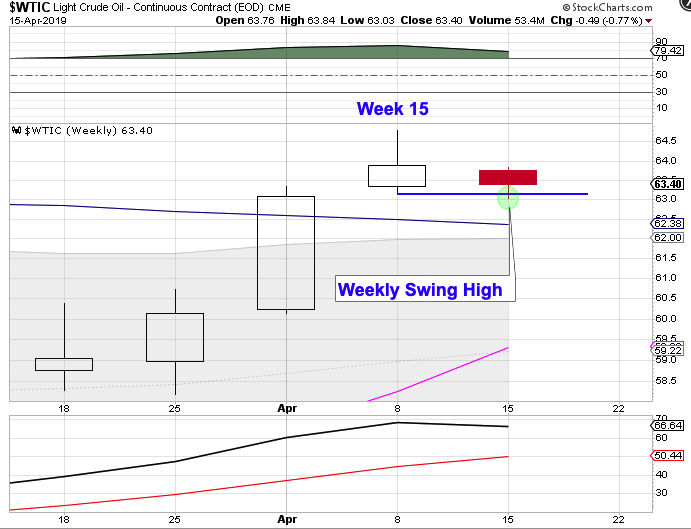 Oil has formed a weekly swing high this week. This is week 16 for the intermediate oil cycle. The new high on week 15 shifts the odds towards a right translated weekly cycle formation. However, oil did print a reversal candle last week followed by a weekly swing high this week. 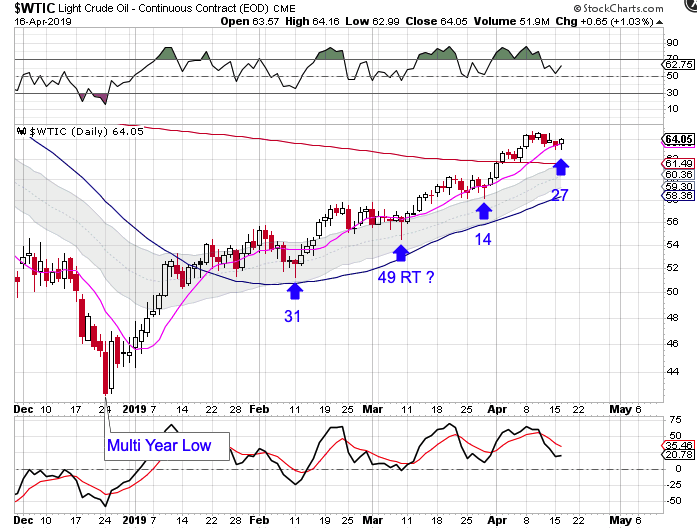 If oil closes below the 50 week MA that would signal the intermediate cycle decline. 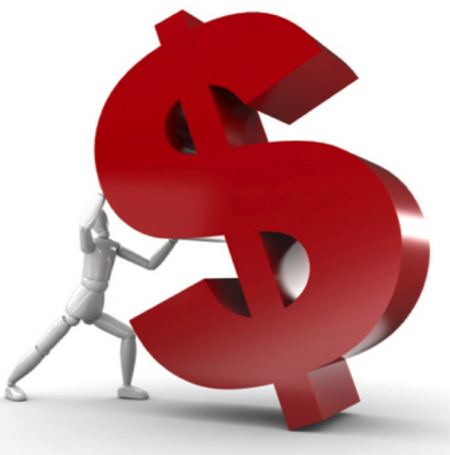 The dollar closed below the 10 day MA on Monday and continued lower to print its lowest point on Friday, day 17. There have been 3 daily cycles since printing the intermediate cycle low in January. They have run short at 14 days, 19 days and 14 days respectively. 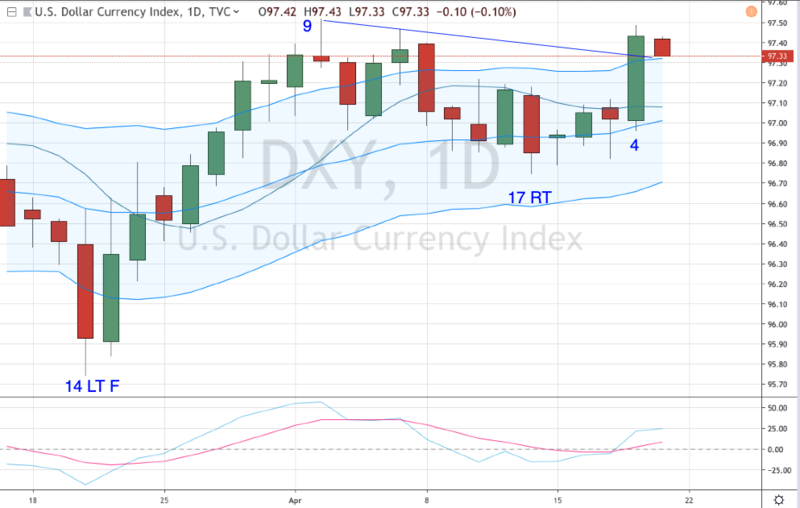 The dollar could continue that trend of shortened daily cycles if Friday, day 17, becomes the DCL. If so, that would form a higher low. If a higher low forms, that would signal that this was the first daily cycle of a new intermediate cycle. That aligns with the dollar being in a daily uptrend. If a swing low forms above the lower daily cycle band then the dollar will remain in its daily uptrend. 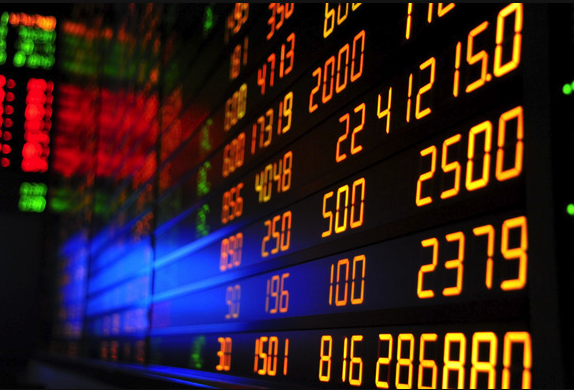 Stocks continued higher this week, printing a high high on Friday, day 25. 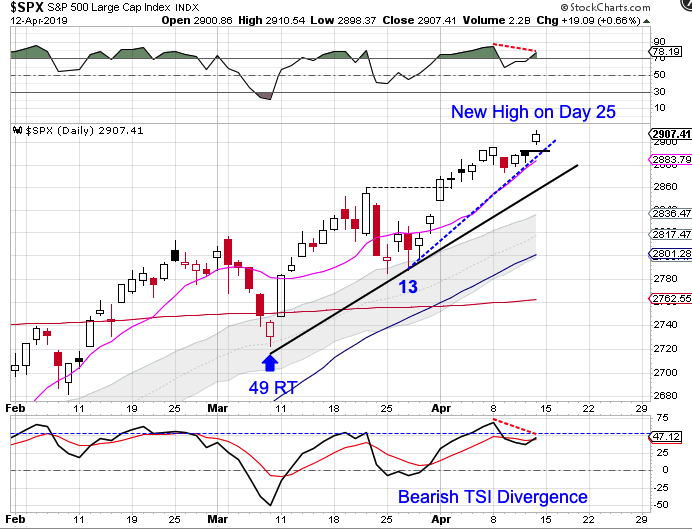 The new high on day 25 assures us of a right translated daily cycle formation, which aligns with stocks being in a daily uptrend. Stocks will continue in their daily uptrend unless they close below the lower daily cycle band. Since printing the day 14 half cycle low stocks have accelerated higher. Friday’s swing low allows us to construct an accelerated trend line. A swing high with a close below the accelerated trend line would be a signal of a daily cycle decline. 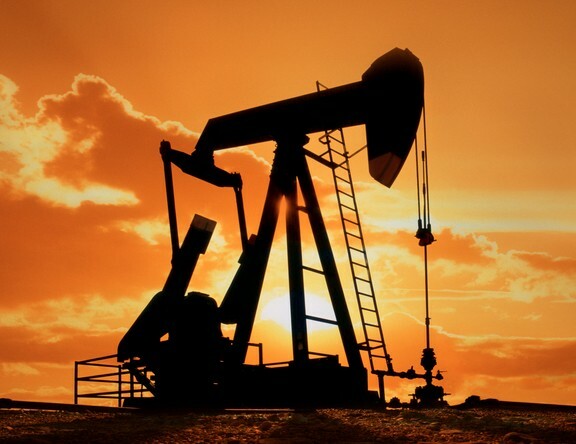 Oil formed a daily swing high on Thursday. 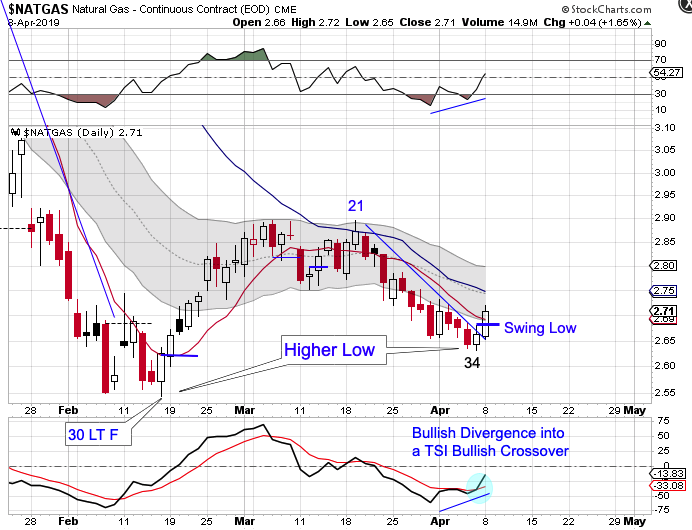 There are bearish divergences developing on the daily chart oscillators that suggest the daily cycle is rolling over. And if oil has begun its daily cycle decline here is what I am watching on the weekly chart. This is week 15 for the intermediate oil cycle. The bearish weekly reversal forming on this week’s candle will ease the parameters for forming a weekly swing high. So if a weekly swing high forms and oil closes below the 50 week MA that would signal to me that the intermediate oil cycle decline has begun. 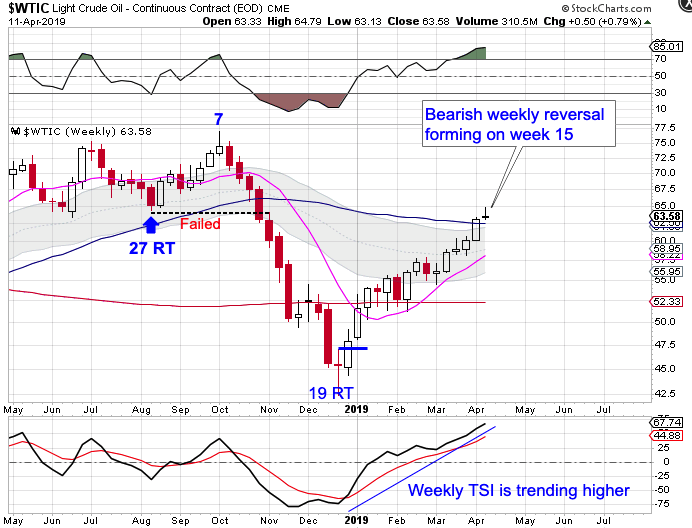 A full analysis of oil’s daily, weekly, and yearly cycles is routinely covered in the Weekend Report. Stocks formed a swing high on Tuesday. Tuesday was day 22 for the daily equity cycle. That places stocks 8 days shy of their timing band for a daily cycle low. A close below the 10 day MA would increase the odds of this swing high resulting into a daily cycle decline. A break below the daily cycle trend line will confirm a daily cycle decline. A peak on day 21, or thereafter, shifts the odds towards a right translated daily cycle formation. Which gives us the expectation of stocks forming a higher daily cycle low. 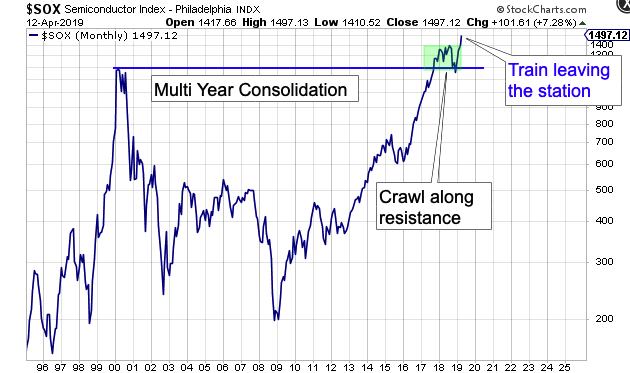 That aligns with stocks being in a daily uptrend. Once the daily cycle decline is confirmed, as long as stocks form their swing low above the lower daily cycle band then stocks will remain in their daily uptrend. 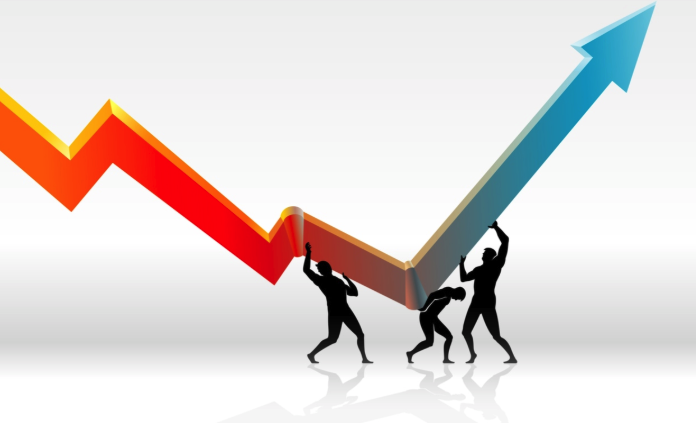 The correct strategy in a daily uptrend is to buy the dip. 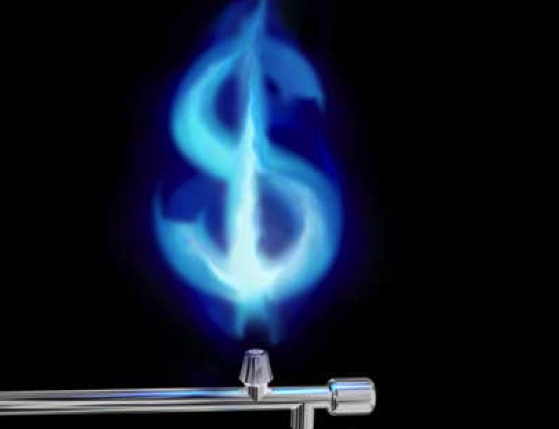 Natgas formed a swing low on Monday. Natgas printed their lowest point on Friday, day 34, to place it late in its timing band for printing a daily cycle low. Natgas formed a swing low on Monday that closed above the declining trend line and the 10 day MA to signal the new daily cycle. 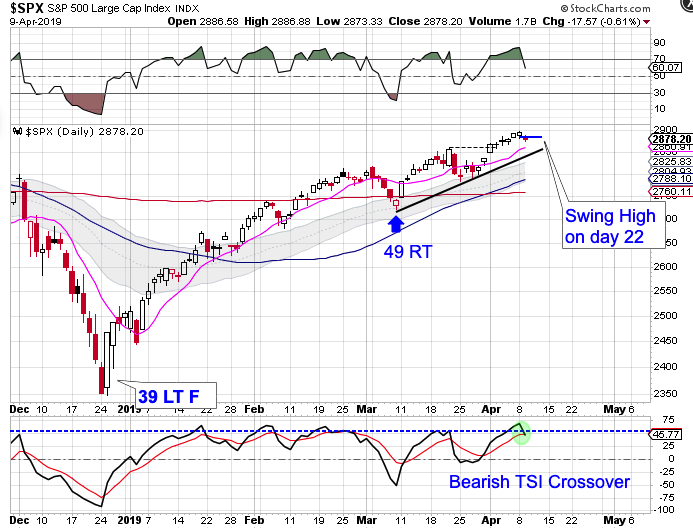 Due to the proximity of the 50 day MA, I would like to see a close above the 50 day MA to confirm the new daily cycle. When Netflix Netflix let customers access to stream-able movies and television on their own computers (and later television screens, that changed the way we watched TV – forever. 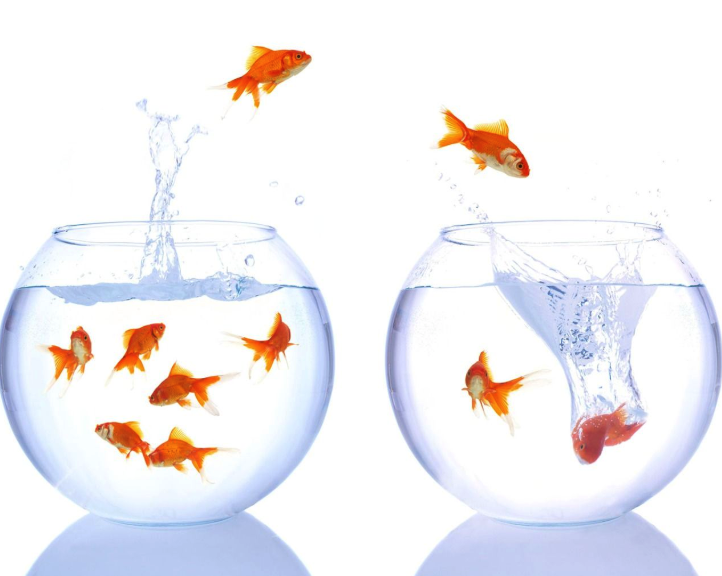 At first Apple did not change the way we did things. But in 2001, Apple released the very first iPod and changed the way we consumed music — forever. Carvana just may be be the next game changer. 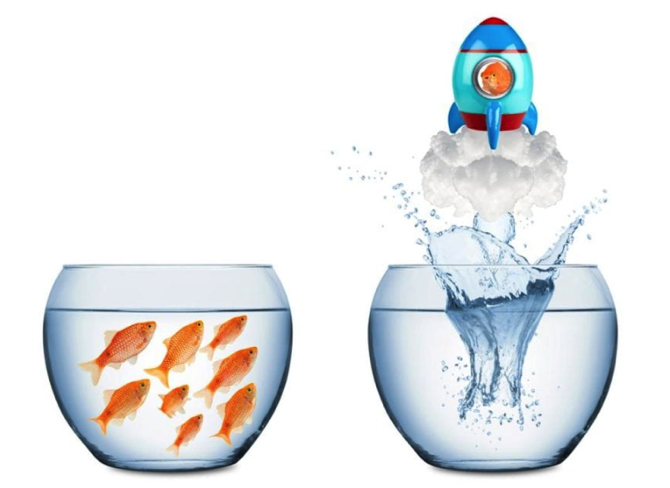 You can read more about Carvana here. Carvana is already up over 445% from when it was first listed. Since is began allowing customers access to streamable movies and television, Netflix is up over 3933%. From the introduction of the iPod back on 10/23/2001 Apple is up over 17489%. So of Carvana can really change the way we buy cars, then it is just beginning to take off.